Centre for Research and Industrial Staff Performance, (CRISP), Bhopal has been established in the year 1997 as a premier service providing institution in Hi-tech areas. The institution has an autonomous status as Society under the bilateral cooperation between the Govt of Madhya Pradesh and the Federal Republic of Germany under their Indo–German Technical Cooperation agreement therein the Ministry of SME, Government of India was the line Ministry. The Department of Technical Education & Skill Development, Government of Madhya Pradesh and German Technical Cooperation agency (GIZ) were the implementation partners. The Society has representation from the industry, the academia, Government and the German partners. 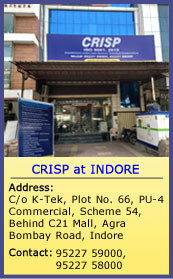 The Headquarter of CRISP spreads over 2.5 Acres of Land and is located in Central India, in Bhopal, the capital of Madhya Pradesh, It has established its centres at several national & international locations. Our commitment to Learning and Development, Precision job work and e-Governance solutions are probably unrivalled and our endeavor to be the most preferred institution is a continual process. technical and management staff capacity building. designing and development of competence based curriculum and supporting learning material for Employable Vocational Training & Skill Enrichment training. Well developed network of more than 500 delighted clients from Industries, Central & State Government and Academia & Developmental Organisations. Role model of self sustainability, replicated in Gujarat and Andhra Pradesh. Role model for German Technical Co-operation Agency (GIZ) for replicating “CRISP-like” successful Projects in India and other countries. Facilitating applications of e-Governance for the State Govt. of Madhya Pradesh and Gujarat. Appointed as consultant for Engineering & Polytechnic Colleges of M.P. for the TEQUIP (Technical Education and Quality Improvement) Programme, under the World Bank Assisted Program. Recognised by Central Government Ministry of Labour for Curriculum and Instructional material development under the “Centre of Excellence” Scheme. The only functional State Initiated Design Centre (SIDC) in the State, set-up by the by the Ministry of Textiles, for offering Design related programmes and consultancy. Trained more than 200,000 personnel from all quarters on sophisticated modules, designed in consultation with International experts & Industries. Developed the Animation Project for “Light Metro Train at Bhopal & Indore”, for the Govt of M.P. shown at the Global Investor’s Meet at Indore, M.P. Over the years, we have also emerged as a pioneering organization in planning and implementing projects for socially disadvantaged sections of the society as physically deprived groups and women. CRISP has been conferred about a dozen awards (National & International) and certificates of appreciation, for its excellent performance in the areas of activities for Leadership, Quality and Perfection.